This is a report on a Diamond D130 discone that has been installed in the weather for about 10 years. The antenna has the whip/coil coverage extender assembly installed. It has been down several times to straighten the whip section which has been bent when large birds grab hold of it and hang their full weight on it. The main plastic insulator has cracked, permitting water into the hub assembly. The antenna, although not serviceable, has not any significant corrosion. The intention is to refurbish the antenna, making a new insulator to replace the failed one, modify the antenna to fit an N type female coax connector in lieu of the SO-239, and install LDF4-50 feedline. I don't know why manufacturers continue to fit PL-259 / SO-239 connectors to UHF equipment, indeed to equipment at all. Perhaps it stems from a devotion to these substandard connectors on a certain continent! I fully disassembled the head, mounted the body in the lathe chuck with the SO-239 end supported on a centre, and parted the SO-239 treads off about 2 mm above (to the left) of the threaded section. I cleaned the plating off the inside of the body for about 2mm from the cut end, so that solder will run in by capillary action. I mounted a flange mounting N type female connector in the lathe chuck and turned the flange off the connector, and machined a rebate at that point that was 12.5mm diameter and 2mm long. This rebate allows the connector to snugly fit into the end of the antenna body. I fluxed the two parts, placed them together vertically and soldered the two with a LP gas torch. I then washed the body in water, and blew it out with compressed air. I removed the circlips retaining the centre pin of the N type connector, and removed the pin. I parted about 16mm off the antenna's centre pin assembly, drilled a 3mm hole about 5mm into the cut end, and tapered the outside of the end down to the hole. I carefully aligned the centre pin axially in this hole and soldered it. It needs to be washed up and dried. A new insulating bush was made from a piece of Delrin (homopolymer acetal), turning an 18mm x 1mm thread onto the outside to engage the threaded hub, and an 8mm threaded hole on the inside to support the inner conductor assembly. I then reassembled the head, carefully screwing the centre pin assembly (with sealant applied) in till the correct centre pin clearance is obtained in the N type connector. After the sealant is set, install the the top hub (with sealant) and the whip/coil assembly. 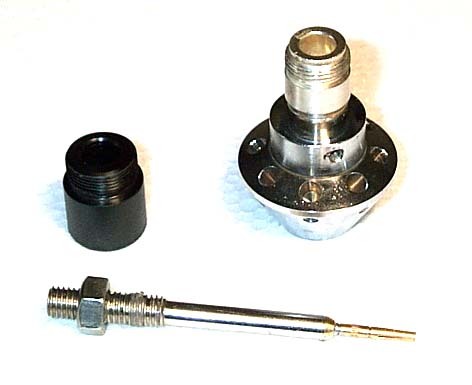 The repaired / revised components: a new insulating bush turned from 20mm Delrin rod stock, the brass lower hub with N type female connector, and the modified centre pin assembly. The discone's main strength is the quite wide bandwidth (over a decade with suitable construction) and a 50 ohm feed impedance. This strength is also its main weakness. Resonant (narrow band) antennas provide a level of front end filtering in a receive mode, that is welcome in radio receivers that lack dynamic range and / or lack adequate front end selectivity, especially in frequency bands that are densely populated. The effect is for instance, that this discone causes much higher noise levels on 2m in a Kenwood TS-790A (good quality desktop ham transceiver), and appalling interference in a Icom IC-T7A (low quality hand held FM transceiver). The wide band behavior is also a disadvantage on transmit from the point of view of out of band products, but this is less likely to be a problem unless it is used on a shared site.